The Fraser River and its tributaries, home to the largest collection of salmon runs in the world, have been heavily degraded through urbanization and agriculture. Most of the flood infrastructure, installed to protect homes and farms from flooding, also block salmon from accessing waterways that once provided valuable overwintering and rearing habitat. Connected Waters aims to re-connect these blocked waterways to the Fraser River, restoring salmon habitat by upgrading to fish-friendly flood infrastructure, and undertaking restoration works like riparian plantings and removing invasive species. Restoring these waterways not only supports salmon populations, but also benefits local citizens by providing thriving natural spaces for recreation and learning, and can even improve flood protection for the surrounding communities and farms. Visualization is often the first step to understanding a problem. 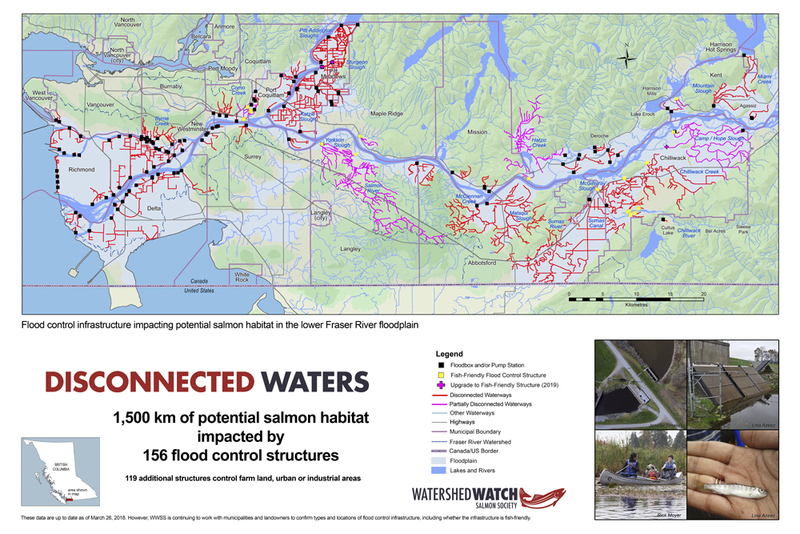 This map helps highlight just how many pumps and flood control structures impact fish habitat in the Lower Fraser watershed. Over 155 structures limit access to over 1,480 km of important off-channel and overwintering salmon habitat. Click the map for a larger PDF version. Watershed Watch Salmon Society advocates for BC’s wild salmon and the waters they swim in. Since 1998, Watershed Watch has been exposing threats to salmon and their habitats, calling for conservation action, and promoting solutions. Watershed Watch works to protect BC’s wild salmon on many fronts: pushing for effective fisheries management and implementation of the Wild Salmon Policy, working to halt expansion of open-net salmon farming, and protecting salmon habitat and ecological flows. Connected Waters is an initiative of Watershed Watch Salmon Society. Visit www.watershedwatch.ca for more information.